1. It doesn’t fit my Fage yogurt container. I was hoping it would, but it’s doesn’t. Then again, not many lunchbox system fits my Fage yogurt container. 2. It looks smaller than I thought. The smallest container fits at most 10 grapes and the large space fits exactly one sandwich. For my adult portion, it might not be too much, but too much food for lunch is probably not a good idea. 3. I probably have to find some small container for my hummus and tzatziki dip or salad dressing since I don’t want the container to smell like hummus or stained with oil. 4. The bag fits the box nicely, but I am looking for a small container for soup or cold orange juice if possible. However, I am optimistic and excited for packing a healthy lunch. A wholesome lunch. Everything costs me $40 even. 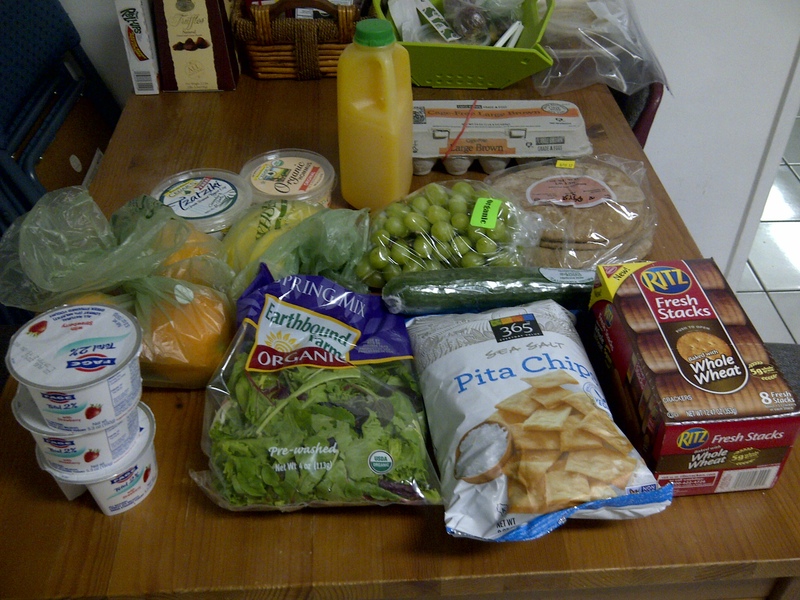 My overall strategy is to stick with a few familiar items a week. This week is pita, hummus, tzatziki, grapes, and boiled egg. Next week might be more bread, prosciutto, avocado, salsa, and a different fruit. I really wanted to include papaya this week, but I think I have a lot already, maybe next week I will include papaya. I also really want to finish everything before buying anymore to prevent waste when necessary. I can probably extend what I have to another week since I know I can’t finish the hummus and such in a week, so maybe shopping every other week and just fruits every week. I have also asked mom to cook some Vietnamese food to go with rice possibly the week after when I am bored with American food, so let’s hope I keep this up! Here’s to a more wholesome food choices and healthier living!